Utility cables are the backbone of a good infrastructure and the foundation of economic development. Therefore they need optimal protection. The increasing liberalization and extension of global data transmission and power supply networks have led to a growing demand for cable ducts. Cable ducts have been in existence for as long as the cables themselves. They serve to protect underground electricity and telecommunication cables from mechanical impact and moisture. At first, they were made from cement mixtures, then from earthenware and later from concrete. 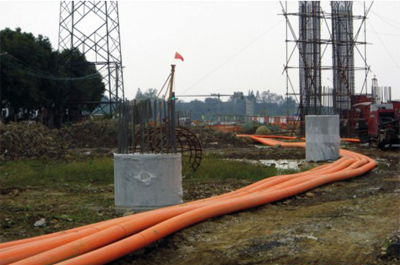 Industrial production of plastic cable ducts began about 50 years ago, and they quickly established themselves in the market thanks to their easy handling properties, corrosion resistance, durability and cost-efficiency. The non-pressure plastic pipes also protect cables against chemical loads from acids or alkalis and rodent bites. Cable conduits also fulfill important tasks as reserve conduits in building installations and protective sleeves for wiring harnesses in the automotive industry. Depending on the application, fully walled or multi-layer smooth pipes are used, but also corrugated pipes.